Spring flowers herald Easter, in particular the crocus with its vivid yellow and purple blooms. 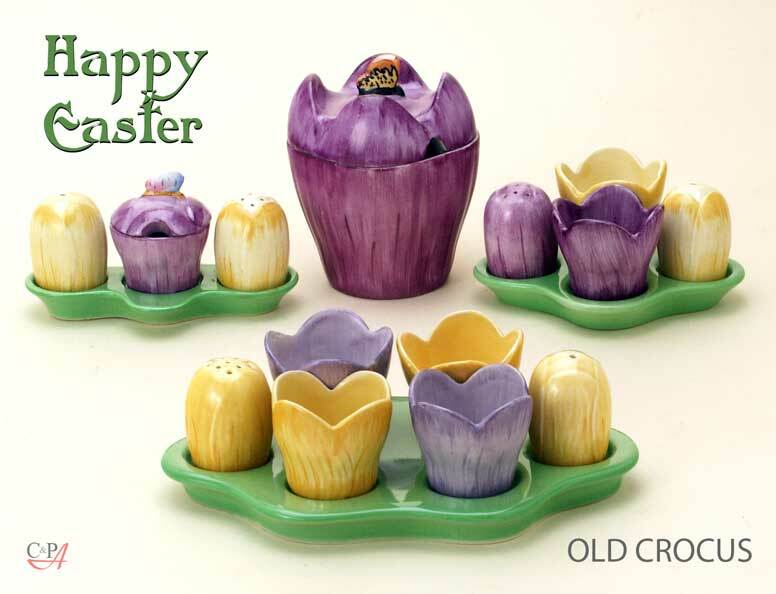 OLD CROCUS, one of the least known of Carlton Ware's Floral Embossed ranges, takes the form of the joyful flower and	turns it into egg sets, a cruet and preserve. All would bring cheer to any breakfast table. I estimate that the OLD CROCUS range was introduced around 1926, which places it under the direction of decorating manager and designer Enoch Boulton. Along with Carlton Ware's enormously successful LETTUCE & TOMATO ranges, which Mr. Boulton also devised, OLD CROCUS heralds the way to many more embossed ranges, both fruit and floral. Some ten years later, Violet Elmer, who succeeded Boulton in 1930, gave her interpretation of the flower with CROCUS , a much larger range, placing the crocus blooms among primroses. 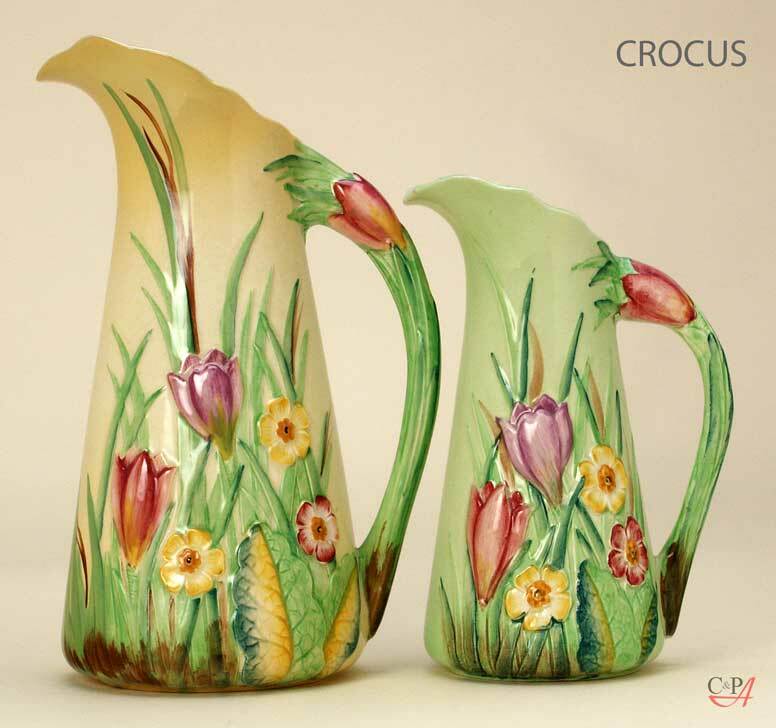 The two jugs below show the typical yellow and green grounds used on most of Miss Elmer's floral embossed designs. As always, Carlton Ware's modellers produce wonderful results from Violet's design drawings. 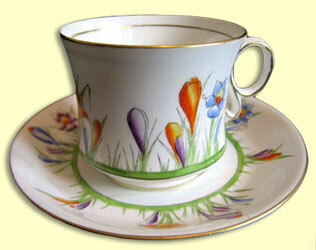 In the late 1920s, Miss Elmer also used the crocus in a pattern for Carlton China. Called Spring Border 4526, our featured flower predominates amongst miniature iris and narcissus. 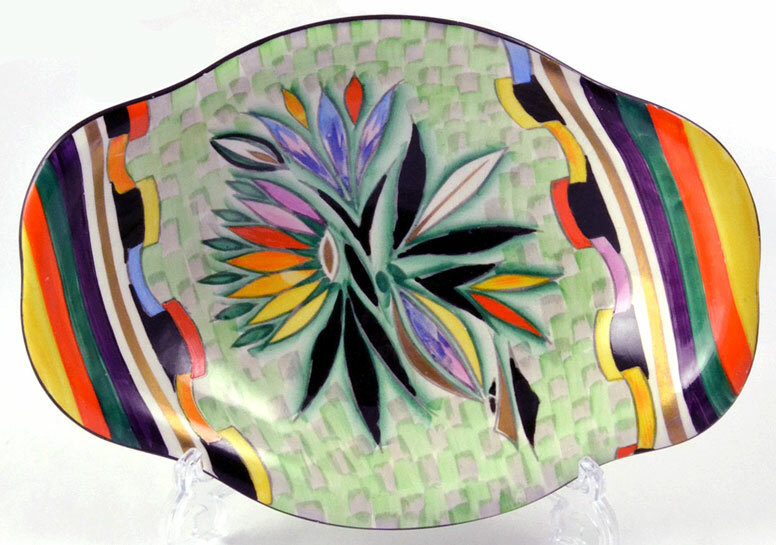 In the 1930s, Carlton Ware introduced a small inexpensive range of freehand painted patterns against what was called a STRAW GROUND . 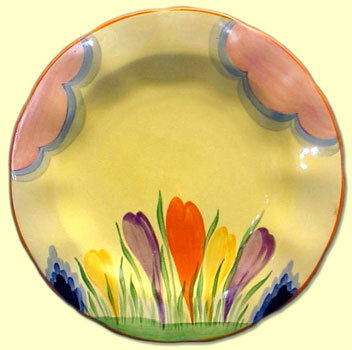 FREEHAND CROCUS 3518 was one of nine different patterns from the range, shown on the plate below. 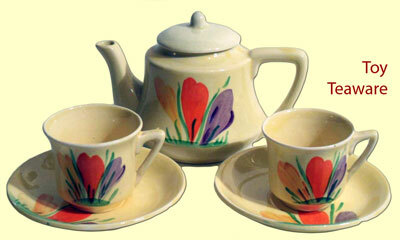 A slightly simplified version of FREEHAND CROCUS was also used on Carlton Ware's Toy Teaware. Carlton Ware used more that fifty different patterns on these charming sets. The most striking of Carlton Ware's crocus patterns is Miss Elmer's MODERN CROCUS 3803 in which the flower is highly stylized and placed against a freehand painted background of chequered brushstrokes in pale green and grey. Rainbow coloured "paper chain" and striped borders enclose the pattern, often applied in unexpected ways as on the REVO shape tray below.